I have been spending many hours in an elementary school lately. I have seen classes in the hallways numerous times and heard many different instructions being given. Am I going against the teacher when I smile at a child in the hallway? I sure don’t want them to get in trouble, but I would like them to see a friendly face on me! Today I saw a class in line, all being good little robots, except the girl at the end of the line. She was swaying and dancing along down the hall. My first thought was “You go, girl!” My next thought was, “She’s going to get in trouble.” Poor thing. 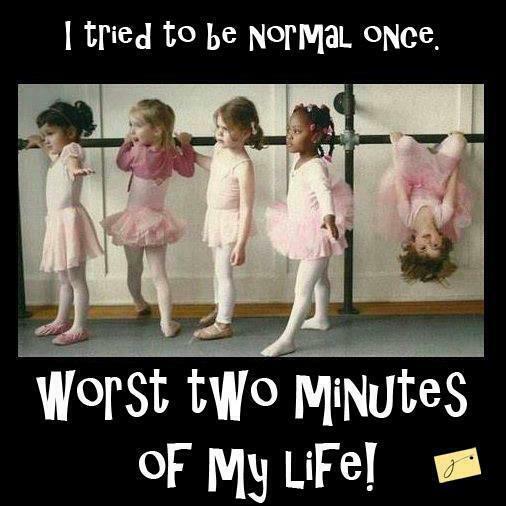 I immediately thought of the picture that went around facebook of the girls at ballet class and the one girl hanging upside down – haha. That would be my granddaughter. 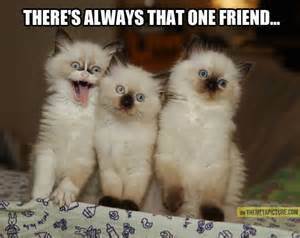 Which also makes me think of that picture with the perfectly adorable cats and one being goofy. Yup I’m the goofy one. It’s fun to have fun, as long as it isn’t hurting anyone. I understand the need to teach children to respect the rules, but are we squashing the heart of the free spirited child? Are we repressing the right to be ones-self? Conform or you’re in trouble. Oh, that just scares me. I hope these youngsters have opportunities, outside of school hallways, to be who they are… artists, philosophers, designers, developers, deep thinkers, pioneers in a career field. If you have a free spirited child, or you are a free spirit, be sure to allow them/yourself a place and time to spread your wings and fly. Don’t break the law or hurt anyone in the process but discover who you were meant to be. Have a fantastic weekend! The little drummer boy may have walked to the beat of his own drum, but he followed his heart and it led him to Jesus (at least that’s how the story goes – grin).